Deep blue double embossed leatherette upholstery with double padding. Capped, reinforced seat and back. 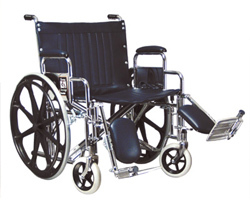 24" x 1" black molded wheels with snap-on tires and integrated handrims. 8" x 1 ¾" black molded front casters. Front slide post design for foldability and rigidity. Side frame reinforced with gussets at all critical load-bearing points. User-friendly swingaway detachable footrests or elevating legrests. Maximum weight capacity 400 lb. 2 year limited warranty on frames and crossbraces.